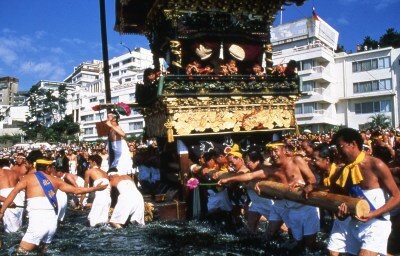 After the signal of gun sound, four floats (6m high, 4 ton each) are pulled into the shallows of the sea one by one, and head to the Otabisho shrine (Wakamiya Shrine). 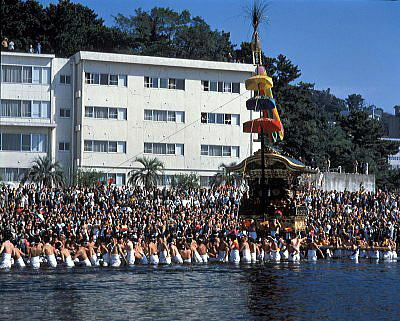 Men with loincloths parade across the sea approximately 300m shouting at"Washoi, Washoi". 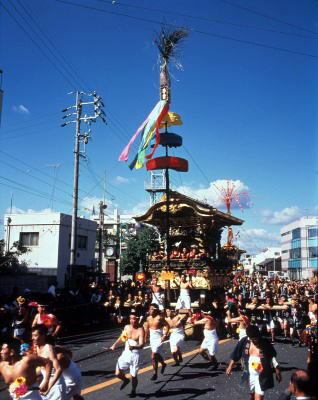 The main god of Yatsurugi Shrine, Yatsurugi-Daimyojin, moved to Wakamiya Shrine by a portable shrine. People believed that this is a message from the god and hold a ceremony of moving. for him. 250m south of Mikawa-Miya Sta. on the JR Tokaido Line. 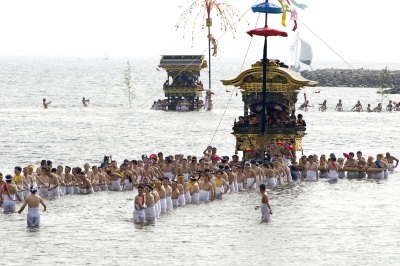 1200m south-east of Mikawa-Miya Sta. on the JR Tokaido Line.